Rod Taylor is the narrator of this mystery/thriller novel -- originally titled "Hard Rock Lovers" -- by author Paul Kyriazi. Billed as the largest production in audiobook history, the story plays out over three and a half hours on four CDs. It has sound, music and a cast of 30, with Rod as the central voice. And a very fine voice it is! Rod returns to his radio roots, bringing written words to life with terrific pacing, verbal flourishes, accents and a rich, warm tone. The audiobook's all-star cast includes many of the author's favorite actors. One of the lead voices is Russ Tamblyn of "West Side Story" and "Twin Peaks" fame as well as an old friend of Rod's from his early days in Hollywood. Tamblyn is the voice of Alan Bartlett, a man whose past and future are intertwined with Shane, an opportunistic, overindulgent rock star. Voiced by James Darren, Shane is central to the mystery: Basically, is he dead or alive? The only man who knows for sure is Jessup, Shane's slick agent, who is portrayed by Robert Culp, Rod's co-star in "Sunday in New York". 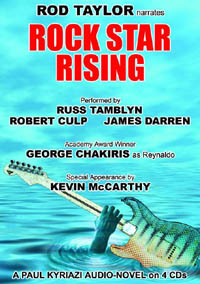 Other famous voices on the audiobook include Kevin McCarthy -- a frequent co-star of Rod's over the years. And there's George Chakiris, also from "West Side Story," who is the voice of Reynaldo, the tough-guy brother of Alan's girlfriend, Connie. Alan Bartlett, a computer programmer looking for a change in his life, heads to Las Vegas for a conference and takes Connie with him. Restless, he meets up with Medusa, who had been a backup singer for the now-dead rock star Shane. In hearing her story, Alan realizes that Shane had been responsible for the death of his brother. When she hints that Shane might be alive, Alan pursues Medusa and the mystery into a world of danger, lust, retribution and rock-n-roll. In flashback, we learn of the rise and fall of Shane and hear a story that is as multi-faceted as it is multi-voiced. I was surprised when Rod made improvements to some of the lines I wrote and even found an "unnecessary and confusing" passage that he recommended I delete. When he explained it to me, I understood right away and deleted it. Rod was not only acting, he was processing the story and making additions and improvements. A real example of a professional interested in his craft. In addition, the author said, "I explained to Rod how we were recording in digital and that he could stop and repeat a line again any time he wanted. That any mistake could be easily cut out later. This was his first time doing it and was amazed how the technology progressed since he had recorded the voice of Pongo in the original '101 Dalmatians.' "
Among the author's many pursuits is filmmaking. His credits include "Omega Cop," which featured a cast very much akin to this audiobook, with Adam West, Troy Donahue and Stuart Whitman.